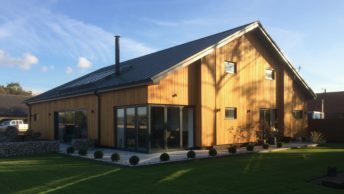 A barn conversion located off-grid in South Norfolk is benefitting from energy efficient ground source heating from Finn Geotherm. 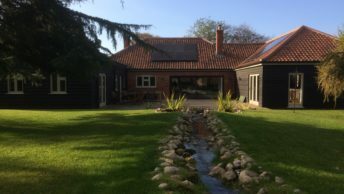 The four bedroom barn conversion in Hethersett was designed and built by homeowner Oliver Clarke. The property used the original 1980s steel framed sheep barn as the base with the new house built inside. 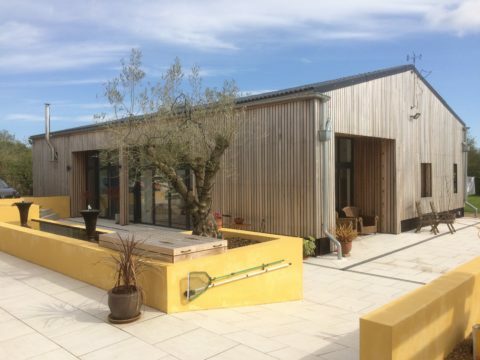 Planning regulations required the appearance of the barn to remain as original as possible so Oliver designed and built bespoke exterior wooden shutters to go over each window and door. A large glass wall and bi-fold doors in the main living area provide stunning views over the surrounding countryside. Oliver converted a second barn to create a workshop for his carpentry business. 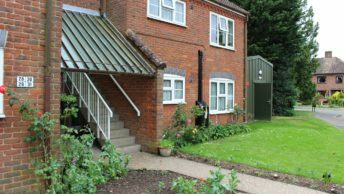 The barn is off-grid with no gas and mains water so when it came to heating, Oliver wanted a system which would be environmentally friendly but also self-sufficient and hassle free. 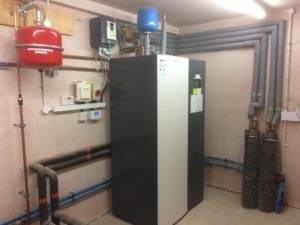 Finn Geotherm installed a single phase Lämpöässä VM14 ground source heat pump with 480 litre thermal store. 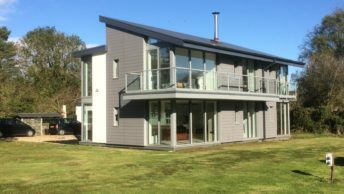 The new system, housed in the workshop, provides all the heating and hot water, harvesting the primary energy from a 700 metre ground array laid 1.2m underground in the garden. The ground loop was installed in white clay, which provided a slight additional challenge that Finn Geotherm easily overcame. Grass, plants and foliage which are now grown above the ground array are not affected due to the low density and depth of the pipes. 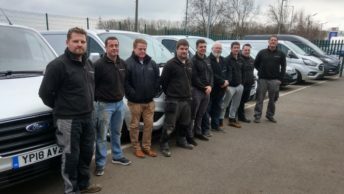 A secondary return on the hot water ensures the system can deliver over 240 litres of hot water almost instantaneously anywhere in the house. The underfloor heating is fully zoned to ensure rooms are maintained at Oliver’s preferred temperatures. The Lämpöässä system is also connected to the internet which enables heating to be remotely controlled and monitored.